So, your parent or a loved one has agreed that’s it’s time to look for home care. Next is looking for a reputable provider of elderly care services for seniors in the comfort of their home. There are so many home care companies out there and some are better than others. In the article below I will outline a few things to keep in mind when looking for an elderly care provider to help you choose a good one the first time. Know what kind of care service you need – is this a companionship for a few hours a week or maybe a home aide is needed for light house keeping and cooking? Or maybe you need a caregiver 24/7 because you parent or loved one is bed-bound? Home care companies offer all the above-mentioned services and more, but it makes sense for you to know what your needs are. But even if you don’t know that’s ok, too. That’s a good chance to call a few home care companies up and ask them questions and gauge their overall performance. Tell them who you need care for and see what services they would suggest. Of course, call more than one care provider to establish a baseline and compile a short list of home care providers to invite for an in-home interview (called assessment). Ask for a list of referrals – reputable home care agencies would have plenty to share with you. And yes, they will only give you a list of happy clients and patients, I know that. Call them, anyway. Ask them about the care they needed, how knowledgeable their caregivers were and whether they would recommend the caregiving agency (you would sometimes be surprised of what you would hear). Ask them also if there were any extreme situations and how the care agency handled it (for example how fast they were to replace a caregiver that called off last minute). Also, ask the people on the referral list if they worked with any other home health care providers before or after the agency you are inquiring about and what made them over the other ones. Longevity and credibility – how long they have been providing home care services to the community. It’s impossible to stay in business for decades with a service that’s not up to par. Home care agencies that have being in business for decades has had the time to tweak their services to fit their audience. Another important thing to ask is whether the elderly care agency is a part of a bigger organization. That’s important because franchisees are required to follow procedures developed by the parent company that have been time-tested. That doesn’t mean that you should look for a caregiver company that’s a part of a well-established home care franchise and have been around for decades but there’s safety in numbers and you want to hedge your bets because changing providers or senior care is not only time consuming but stressful as well. 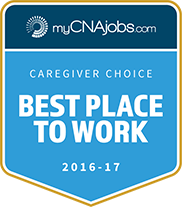 Employee training and care – you want to know how well they care for the caregivers they send to your house. First off – are they screened, and their background checked? There are countless caregiver horror stories and you need to know that the person entering your house is trustworthy. Are they trained and up-to-date on the latest in-home care? Do they undergo training on a monthly /quarterly basis? Things in the field of elderly care change rapidly and new techniques are being developed so you only want to work with the caregivers who stay current. Are caregivers protected with written personnel policies, benefits packages and malpractice insurance? You caregivers employees of the company because if they are not and they happen to slip and fall in your home and break an arm you can be sued for negligence. However, if they are employees of the home care company incidents like this are covered under their insurance. As you can see choosing a caregiving agency for your elderly parent or spouse could be a complicated process. For that reason, you need to take your time when choosing a home care company, so you’d have to choose once. "I am thrilled to call Assisting Hands friends and partners. I have had the opportunity to refer several of my clients/families to them and the feed back has been very positive. They do a great job." "My mom was positive about your staff staying with her. I want to thank Doris who stayed and helped me pack up my mom’s things. She was so helpful and took a lot of stress off of me. Your coordinator went above and beyond to help me when I called at 5:30pm on a Friday. She was so understanding and really came through for me. I really appreciate all her efforts."